Your delightful new guinea pig pet is so sweet and cuddly, but uh-oh, you’re sneezing, eyes are running, and skin is iching! There is no use denying how adorable guinea pigs are. However, there are some people who don’t find them lovable, especially when they are allergic to these small rodents. According to Guinea Pig Manual, the most common symptoms of guinea pig allergies are shortness of breath, itching, wheezing, runny nose, sneezing and skin rashes. But the little, furry creature means no harm. Do not panic if you find yourself experiencing any of the symptoms when handling your pet or cleaning its cage. There is no need to blame your pet friend. Your allergies may have been triggered by its saliva, secretions, or urine, not its hair. So, what do you do in case of an allergic reaction? Petfinder suggests that the most basic thing to do is visit an allergist and take a test to determine the true cause of your allergies. You could be thinking that your allergies are caused by your cavy, but it was actually the hay or other bedding materials. Once you have confirmed that your pet is the cause of your allergies, here are five ways to deal with guinea pig allergies. These will help in alleviating the ache, soreness, and discomforts you are experiencing. Antihistamines – Used to treat allergic reactions, antihistamines relieve the symptoms of an allergy fast. You can treat your reaction in one or two days. Some people find relief by taking an allergy tablet immediately after they touch a guinea pig, and they don’t have to deal with the unpleasant side effects of their petting. Your allergist should prescribe and administer a suitable antihistamine. Taking decongestants – Some people who are allergic to guinea pigs complain of having a blocked nose, or they have trouble breathing. 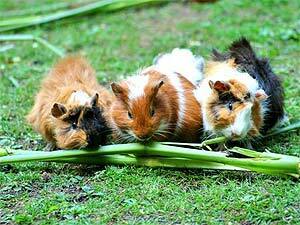 If you are among them, taking a decongestant after handling your guinea pig will greatly reduce your suffering. There is no need for you to get a prescription since decongestants are over-the-counter drugs. You can also choose nasal spray decongestant, which may be combined with an antihistamine for a stronger effect. However, it is advisable to see a specialist before buying the medicine. Get a prescription if you have blood pressure problems, an enlarged prostate, or a cardiovascular disease. Use a corticosteroid nasal spray – This nasal spray is inserted in the nose and sprayed to the nostril’s outer wall. It offers an immediate relief for nasal congestion. It does not require a prescription, but there are cases when you need to have a prescription to purchase this treatment. Use an air filter or purifiers – Getting some fresh air is a quick way to get allergens out of the house. It will drastically reduce respiratory problems to bring your condition back to normal. An air filter or purifier will also remove the harmful allergens that cause skin problems. Open your windows for ventilation and grab an air purifier as soon as you start feeling the symptoms of allergies. If you are asthmatic, which triggers when you touch a guinea pig, then use your inhaler or take prescription asthmatic drugs. Getting your asthma medication will quickly alleviate your breathing problems. There are things you can do to prevent guinea pig allergies. First, put on a pair of gloves and wear a mask while cleaning your pet’s cage. This basically eliminates the risk of getting in contact with the animal’s secretions. Remove and wash the clothes you had on after handling the guinea pig. And if it’s possible, you can ask someone else to clean the cage instead of doing it yourself. One of the best ways to prevent allergies is not to get too close to the guinea pig or even touch it. But how can you not touch your pet? To mitigate the risk of catching an allergy, hold your pet using a cloth or towel. Once you are done, you have to make sure that you wash the towel after. Aside from that, it is important that you wash your hands after each and every encounter with your guinea pig. Do not sit your pet on your bed, sofa or any resting place. As much as possible, place your cavy’s cage in another room, not in your bedroom. According to CostMentor, the actual guinea pig cost is around $40 to $60, but that is nothing compared to the companionship and joy your furry little friend gives you. It may mean little to you if it causes you minor allergies as these can be avoided. Try any of the treatment methods when your allergies are triggered, but it is best to seek your doctor when the condition worsen. Also, remember to take the precautionary measures discussed to keep allergies at bay. Do you have a story about guinea pigs that you’d like to tell? Simply sign up on Pet Talk and join in!